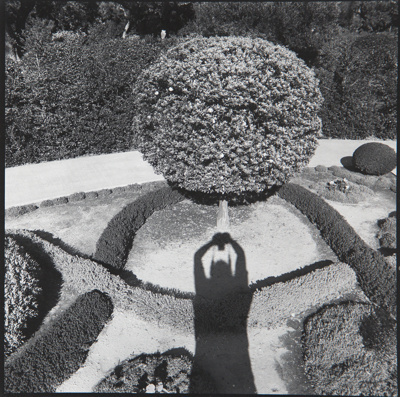 About this objectThe shadow of Parker holding a camera seen on the trunk of a short tree with its branches manicured into a sphere in a garden. Subject and Association DescriptionBart Parker (1934-2013) initially studied literature and creative writing before switching to photography and attending the Rhode Island School of Design where he studied with Harry Callahan. Parker taught for the majority of his career at the University of Rhode Island. His work is best know for layering and sequencing of multiple images.